Fresh from the success of the roll-out of several J Series smartphones, Samsung Sri Lanka has another delight in store for Galaxy fans with the launch of the Samsung Galaxy J6 in Sri Lanka, the first J series smartphone with flagship features such as the Infinity Display and the cool new Chat Over Video feature. 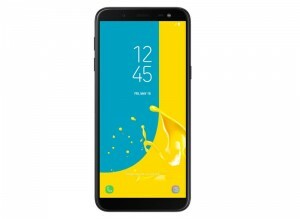 The Samsung Galaxy J6 is the latest smartphone to join Samsung’s ’J’line-up and is highly budget-friendly at an affordable price starting from Rs. 36,390. The smartphone has sleek curves and an ergonomic design with elegant style and comfortable grip. The Galaxy J6 also includes a rear fingerprint scanner so that the user can unlock it without having to wake it up first and a 3,000 mAH battery which is built in along with a 1.6GHz Octa-Core processor, 3GB of RAM, 32GB of internal storage and a micro-SD slot. The device also comes with Samsung’s advanced memory management feature that automatically direct content from social media applications to the external memory card. The Infinity Design on the Galaxy J6 gives users nearly 15% more viewing space without increasing the overall size of the device. The super AMOLED screen produces sharper contrast and more dynamic colour. A 13MP camera can be found on the back while selfies are captured with an 8MP camera and features such as selfie focus and the built-in LED flash help users to capture clearer self-portraits. The front camera on Galaxy J6 smartphones feature an adjustable selfie flash, allowing consumers to snap stylish selfies, from day to night. AR stickers can also be added to photos captured with the Galaxy J6. The Galaxy J6 comes with two memory variants; 32GB with 3GB and 64GB with 4GB, priced at Rs.36,390 and Rs.45,890 respectively. The device is available in Blue, Black and Gold color options at authorized Samsung dealers: Damro, JKOA, Singhagiri, Singer and Softlogic from mid-June onwards.